Sitting in Hotel Salubrious, after an excellent day. The hotel is not so bad – clean and with decent sheets, but no pretensions to grandeur. No appeal to my conscience to reuse my towels: instead there is a sign saying that, for guests staying Saturday to Saturday, towels will be changed on Tuesdays and Thursdays. For guests staying Monday to Friday, they will be changed on Wednesdays. The other guests appear to be working men who stay here during the weekend and then return home at weekends. The elderly Irish lady who appears to be the owner was clearly desperate to know why I am here. Eventually, she came straight out and asked me, and I then heard her repeating every detail of my walk from yesterday in the kitchens. I took the train up to Herne Bay and met Beth. We started walking around 9.30 – right down on the water’s edge, and at Bishsopstone round the base of the cliffs on the beach. At some points the sea was so rough that we took the cliff path back up to the road lest we be swept away. In particular, the stretch between Birchington and Westgate was very wild. 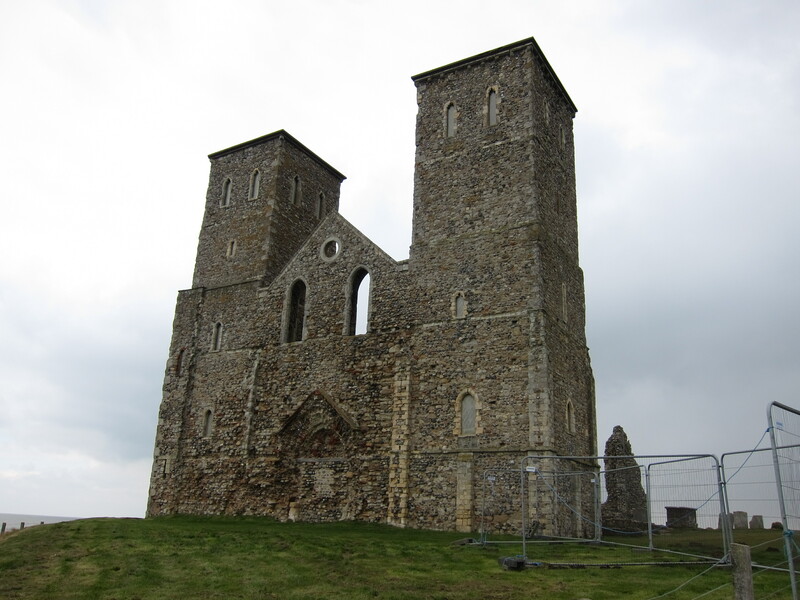 Our first landmark was the ruin of St Mary’s Abbey at Reculver – originally an Anglo-Saxon monastery founded in 669 AD by King Egbert of Kent, constructed on Roman foundation, then extended in the 12th Century. The Roman walls from the fort of Regulbium were still visible in parts. The majority of the Abbey was dismantled in the 19th century, but the towers were left as an important navigational landmark, and indeed they were visible in both directions for most of the day. The Roman walls were covered in a plant they introduced and were fond of eating, known as alexanders, similar to celery with yellow flowers. At Reculver, the Saxon Shore Way goes inland, and the coast path I am now following is the Thanet Coast Path. Apparently, at the time of the Romans, Thanet was still a completely separate island, with a channel a mile wide between it and the mainland, n ow the River Stour. .
Didn’t see much in the way of wildlife, just one fabulous flock of ducks (or maybe oyster catchers) is the air, wheeling and swooping, presumably looking for a roosting place. 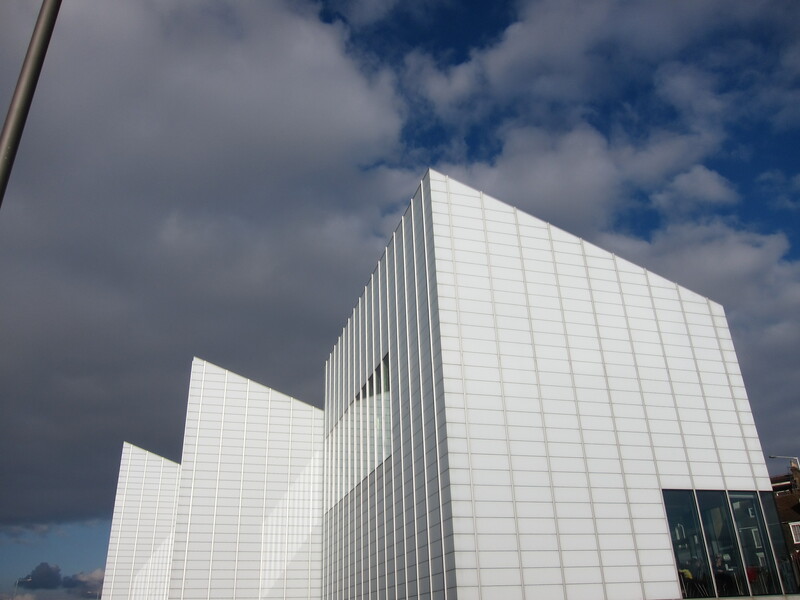 We arrived in Margate, which apparently became popular after the 1753 invention by local glovemaker Benjamin Beale, of the covered bathing machine, at about 2.30 and found an excellent tea shop (see review). 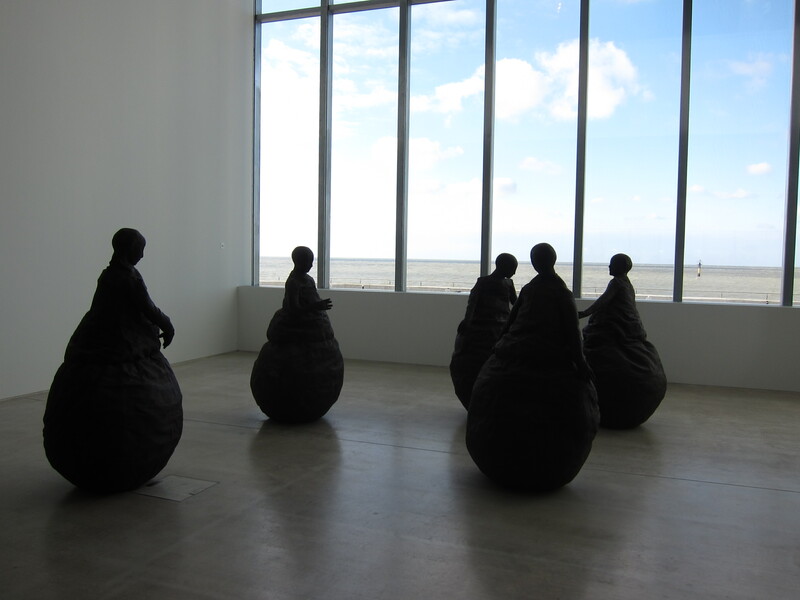 We then had time to visit the Turner Contemporary Gallery – a really interesting piece of architecture with a superb sculpture by Juan Menoz (picture). As we came out the sun was streaming down onto the sea – hopefully a sign of better things – although the wind is still fierce. Rachel has texted me that she is joining me tomorrow for the walk to Sandwich.